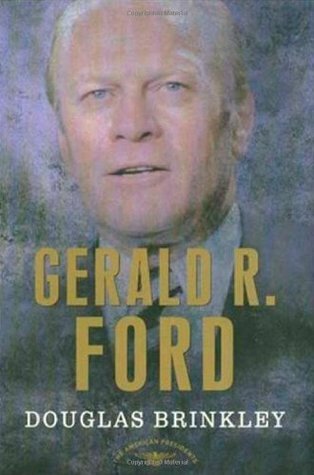 Published in 2007, “Gerald R. Ford” is Douglas Brinkley’s contribution to The American Presidents Series. Brinkley is a professor of history at Rice University and the author of about two-dozen books including biographies of Rosa Parks, Henry Ford, Walter Cronkite and Jimmy Carter (which I will be reading shortly). Given the format of books in this series, Brinkley’s 160-page biography of Ford is unsurprisingly crisp and often fast-paced. Only rarely does the narrative dwell on individual moments in Ford’s life for very long. And where the efficiency expected of books in this series can prove inadequate for particularly complex or multi-faceted presidents, it would seem well-suited to Gerald Ford’s life. The author’s review of Ford’s childhood is undeniably competent but far too brief. Just a dozen pages sweep Ford from birth to his election to Congress. But because his twenty-five year career in the House of Representatives was relatively dull and uneventful (certainly by LBJ’s standard), Brinkley’s description of this period is commendably concise. But if brevity can be a virtue, Brinkley’s choice of what to filter from the text is occasionally perplexing. Nowhere does the author discuss the historically thorough background investigation Ford endured as part of his confirmation as vice president. Yet the reader learns how the sailors on the Mayaguez (a U.S. ship seized during the final days of the Vietnam War) taught their captors to use the ship’s shower facilities. Given the limits imposed by the book’s format, the author is regrettably unable to tease out the often-fascinating interpersonal dynamics between President Ford and his top staff, including Donald Rumsfeld and Henry Kissinger. And Brinkley is able to provide only the sparest of insight into Ford’s inner-self, family life, retirement years or political legacy. But his analysis of Ford’s precarious political position within the Republican Party during the 1976 presidential campaign is excellent and he offers an interesting account of Ronald Reagan’s attempt to gain the Republican nomination at President Ford’s expense. And Brinkley sprinkles enough artful one-liners in the text to convince the reader that the full weight of his insight and expertise is not revealed in these pages. Overall, Douglas Brinkley’s “Gerald R. Ford” is an articulate, efficient and unquestionably competent review of the life of the 38th president. But while the author does a respectable job with a difficult format it seems that Gerald Ford, for all his bland decency, is surprisingly hard to capture in just 160 pages. I see you’re now reading Carter so congratulations on checking another one off the list! And it’s outside the realm of your project, but I’m curious if anyone has opinions on Donald Rumsfeld’s Ford book? Looks like it could provide a more lively, if biased, look at his presidency.